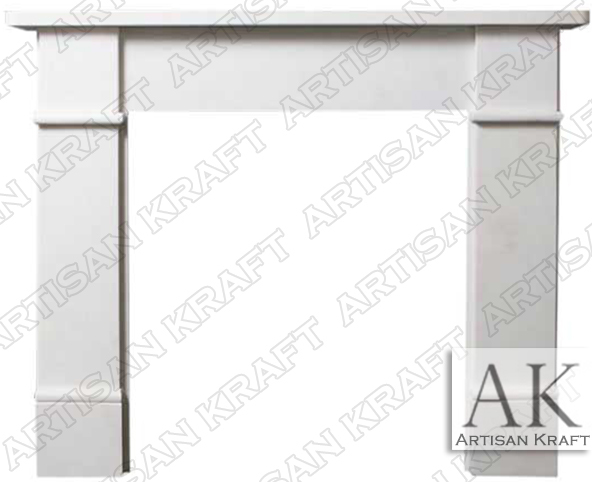 Essex marble mantel fireplace carved from white in the image. This is a contemporary fireplace surround design with very few details. The straight legs on the sides are detailed only by a pronounced rectangular trim piece towards the top. The bottom of the legs has a pedestal that can be removed. An inexpensive option for those on a budget. Can be made from cast stone or limestone to your dimensions. This design also looks great in a honed black marble. The honed finish is one that is not polished. This means that it is not shinny but the stone has a flat finish. Will also work well in a modern setting. Typical Dimensions: 60″ wide x 48″ high *can be made to custom dimensions.